This is the third post on the subject of thankfulness and gratitude in a string of posts. I was having lunch with a friend today and something came out of my mouth aloud and caught my attention. It sounds weird, but much of the value of speaking aloud, in my opinion, is to clarify our own thoughts. It isn't until it is spoken aloud that we think we have it solved. There might have been years of thinking ahead of this too. What I said was that I had no more regrets. I knew I was headed in this direction, I just didn't know I had arrived until it exited my lips. When it came out, it was so distinct and matter of fact. My friend was surprised and questioned my conclusion. How could it be that you have no regrets. Everyone has regrets. I used to carry quite a load of regrets and have carried and added to the burden for many years--even most all of my life. I could have been more this and less that. I should have made this decision instead of that. I didn't finish that. I could have been a contender. . . If I had a do-over, I would do it differently. That's another form of regret. I explained that I have become a very grateful man. In this transition, I have accepted and became grateful for every decision I've made, every choice I've made, every circumstance I found myself in and more. If one becomes grateful for every step of the way to where we are now, there can be no regret. Regret is like an anchor tied to our leg. Every regret adds another anchor. Over time, we gather quite a collection of these anchors. Or we could think of it as baggage or luggage. The more we add, the greater the load we must carry around all day long. But, what is more important a perspective, I think, is that a regret is a negative link to the past and as we hold on to these negative links in the past, we take away opportunities to live in the present. Some people might say, "put your regrets behind you." 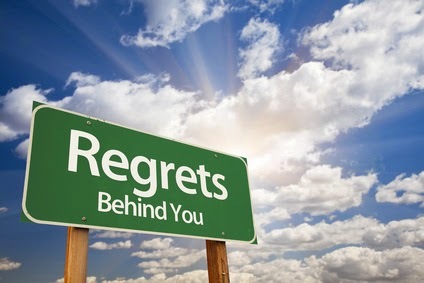 But, really, regrets are things of the past so they are always behind you. It doesn't work to try to put them behind you or overcome them. You dissolve them with gratitude and they are gone. My favorite way to describe this is the tug-o-war rope. We hold on tight to the rope and pull against a force that will not allow us to win. It will sometimes let us make movement, but it is only playing with us. The only way to stop the regret is to "let go of the rope." It is precisely that simple. Just let go. Once we have let go, we can find the gratitude in the event rather than the ill that fostered regret. The Key Is Always Gratitude And Appreciation. It Is Love In Action. Spread Some Joy Today--by letting go of a rope a day. That's good. Just let go. If that's too much right now, let go of one rope a week. It isn't a race. does so without the help of others. acknowledge this help with gratitude." This will be the first of many posts on the subject of gratitude and thankfulness. This one will be longer than normal. I want to share a letter I wrote to my sales staff I just found in a drawer. It was dated April 24th, 1991. 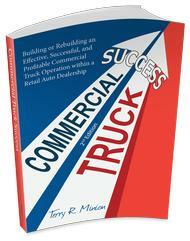 I was the Commercial Truck Manager at Biddulph Chevrolet in Santa Rosa CA where in April 1989 I began that department. I think it is important to tell people in various ways how much they are appreciated. It may be unusual for a sales manager to write such a letter to his sales staff, but it isn't for me. Pardon the length, and I hope you appreciate the depth of the message. I will even use the real names for they are all readers of this Daily Inspirations. I am proud and pleased to work with the likes of you three gentlemen. I don't see your faults when I look at you, but your assets. And they are many. I appreciate how you take responsibility to follow through on tasks and promises. That is so important and often taken for granted, but I do appreciate it. Your skill and knowledge are superior. You don't go around giving out misinformation, but take the time to look it up if necessary to make sure it is accurate--even if it means losing a sale based on the information. That too is extremely important. Your word is as good as any signature or collateral is concerned with me. You don't know how much I value this virtue. It is worth everything as far as I'm concerned. You negotiate and close your own deals. How else would we run this kind of business and get anything done? I've been chastised for this, but so what? I think it is the way it should be done and I'm proud of how well you do it and how you improve the process. You deal with people in a very straightforward, pleasant manner. What else could you want in a professional? And, your customers appreciate it too though they probably won't say so generally. You know they do. You care about your customers. Some care for the commission far more than the customer. You've seen it, but you don't act it. Your frustrations have been with others not feeling the same and I understand that. And, I appreciate the fact that you care. You help each other. If one of you has a question or a problem, you listen to them and help them. What more could one ask of a "team?" It's teamwork in action at the Giant Biddulph Chevrolet Commercial Accounts Department and I appreciate it. You give me good feedback. I don't have all the answers. Sometimes I don't have any, but you offer your assistance freely and it does not go unnoticed. Little things. The cars are opened daily without the slightest hesitation or a word ever from me. The lot is arranged well and periodically changed. You don't hesitate to go the extra mile to serve your customers well. Picking up units at their business and bringing them into the service department, outside deliveries and whatever hours or days the customer may request. You deliver promptly and take good care to insure that the paperwork is done right and monies collected. What else would someone want of a professional? You're creative enough to think of switching bodies, changing suppliers, all toward getting the job done well and as promptly as possible. Your deliveries are thorough and done well. You definitely go the extra mile as far as I'm concerned. Bottom line, upper line, middle line, whatever line I look at, you guys come through as far as I'm concerned and upon thinking about it (although I appreciate it more than I say), I felt a need to put this down for the record. Thank you for all of your help; your support; your encouragement; your professionalism; your skill; your dedication and follow through; and lastly, your friendship. I appreciate all of you. The Greatest Benefit From Gratitude Expressed To Others Is The Feeling Within Yourself In The Doing. Spread Some Joy Today--Tell someone, or your team how much you appreciate them. is knowing when to quit." This quote is only for those who think there could ever be an end to such a thing as self-improvement. Personally, I cannot imagine such a thing. Nor would I want to. I Think Today I'll Stop Growing? NOT! Spread Some Joy Today--by learning something new every single day! Here's another quote to go along nicely with this great quote from Wayne Dyer by Esther Hicks and Abraham: "Hard work is not the path to Well-Being. Feeling good is the path to Well-Being. You don't create through action; you create through vibration. And then, your vibration calls action from you." I think that many times we worry because we feel that we should be doing something and though we cannot actually do something at the moment, we worry about it which indicates we are giving it importance and that helps us to feel as if we actually are doing something about the problem. But the reality is often that we only perpetuate the problem and/or increase the size or importance of it in our lives. In considering this topic, I have gone backward in time to many of the times I was worrying--even worrying with great stress, and I cannot think of one single time where the act of worrying did anything at all to improve the situation. The hard work of worrying (and we all must know it is hard work), is not the path to Well-Being or the solution even. Feeling good is the path. From that vantage point, any action we are inspired to take will work perfectly. By Choosing Good Feeling Thoughts, We Clear The Path To Our Well-Being. Spread Some Joy Today--Let go of the rope. Love yourself enough to do so. to need someone else to change." This quote indicates a common thread of thought that keeps the world in drama for all eternity. Maybe we are lazy about the need to change, or maybe we just don't want to, but clearly, often, our best solution is that someone else needs to change, not us. It doesn't matter if it is a spouse, expectations of how customers should act, whether or not people listen to us clearly, and much more, and in all of these, we so often look to relinquish responsibility to others for the change we seek. Here's a good question: How's that workin' for ya? Or, how is that working for me? I would expect not well. I had this song in my head today. . . you know how that works, right? Can't seem to get it out, but this one was talking to me. It was Ricky Nelson singing Garden Party. The chorus is so familiar: "But it's. . . all right now. I've learned my lesson well. You see, you can please everyone, so you've got to please yourself." This is so well said. Trying to please others, let alone everyone is a total waste of time. However, when you please yourself, others can benefit from that alignment. It's like having joy. Or, deciding to enjoy yourself every moment of every day that you can. These are things you can only do for yourself. Just imagine waiting around for others to come through on these tasks. It ain't gonna happen. But, when you decide to accept the responsibility that only you have to create these things for yourself, anyone and everyone around you benefits from your countenance. Isn't that interesting? One way is a guaranteed failure and the other a guaranteed success. It's amazing and true. Try it for yourself and you will see that it is as much true for you as it is for me. Spread Some Joy Today--by focusing on your own well being. Experience joy as often as you can throughout the day. we ought to walk through the rooms of our lives. . .
Whatever it is, the first of the week, month, year, we assign a time we are going to survey and see what's what and what should be done. As the quotes says, it seems so often we are looking for what is wrong and needs to be fixed. Don't do this anymore, don't do that, change this, change that. As Ellen Goodman states, why not look for potential, as in what could be. It is more a what if game to see possibilities and this activity would most likely have a far greater and deeper reaching benefit than finding fault. But, I'm going to take Ellen's statement even further. Instead of finding fault, or seeking potential, how about if we focus on what is right, what is good, what is working, what we love, how much joy we have, how much abundance we have, how much love we experience and how much of an unending supply of love exists for the taking, giving, sharing? How about celebrating every little thing? How about telling each other that we care and love and appreciate them? How about if we love our neighbors and our bosses and coworkers and everyone we meet? How about one single goal of seeking and experiencing joy? I guarantee that this will change your entire year, and the rest of your life. Spread Some Joy Today--Alan Cohen wrote a wonderful book called, Joy Is My Compass. What a wonderful strategy for life! I recently rewatched the movie, The Ultimate Gift. I enjoyed the movie and the lessons that one of my all time favorite actors, James Garner, gave out to enlighten the young grandson played by Drew Fuller. In one lesson, he was talking to his grandson about money and how he had been broke several times and he said that being broke is as good a place as any to start. In fact, as Nido points out, where ever we may find ourselves, in whatever circumstances, that is also as good a place as any to start. Indeed, it is the only place to start, isn't it? Yet, somehow we don't normally think of it that way. Another way to put it might be this: Today is first day of the rest of my life and I will rejoice in it and make the best use of it, and all the while, find enjoyment as I do. It doesn't matter if we are at the beginning, in the middle, or near the end. Wherever it is will work out perfectly. . . if we will but relax in the confidence that we have the power and the ability to choose. Today Is A New Day. Now Is A New Moment. Spread Some Joy Today--Whatever you can do to create the feeling of joy in your life, in your moment, will be perfect. The spreading of it requires zero effort. This is the best way to start my day. It is the best way to keep my day in joy. It is the best way to end the day. Becoming a person filled with gratitude and finding ever more of it as a result has changed me entirely. Most importantly, it has changed the way my life feels every single day. There is no such thing anymore of having a bad day. It doesn't happen. I used to get two or three colds, flu, and sore throats a year, every year. I haven't had any in over six years. I think it is gratitude because that is the most significant change. without having to hurt yourself, or anyone else to get it. That's how powerful you are." Yes. And, what a time to teach it--as a child. I often think what my life might be like had I learned at a young age what I have learned in the last six years. None of what I have recently learned was ever taught in any school or church I went to. It was not in college either. Bits of it were in some of the psychology books I read in my twenties. It wasn't taught in any business class or business seminar I attended. I was unaware of its existence then as I see it in its present form. Yet the learning that I did accept and reach for was valuable enough. Maybe it was as Alan Cohen states: "Worldly success is achieved by doing. Spiritual success is achieved by undoing." As I consider this, it resonates with me. I think much of what I have done in the last six years has been undoing, or a strategic letting go. As I let go, what remains becomes more clear. It takes it from life being a struggle to life being an adventurous journey. That would be worth teaching at a young age. Children and adults need to know and would benefit from the knowledge that they have all the power they need within them and better ways to make use of it for their enduring enjoyment. To know they have the power to choose in any and all circumstances would create within them a blameless environment. Whereas, I spent most of my life blaming anything I could, all of which were outside of me, and this was taught by my parents own examples. I had the power and didn't even know it. I Know It Now. What An Improvement. A New Life. The Power Is Mine To Use As I See Fit. Spread Some Joy Today--by choosing your thoughts. A good choice now and everyday is thoughts that create a feeling of joy. You have the power in any and all circumstances. "Wherever you are, is just fine. . .
from wherever you are. . .
in relationship to where anybody else is. with where you want to be." After I read this again today, it struck me that I have arrived at being okay with where I am and who I am. In looking back, I can see that I was always not enough. I didn't measure up to the people I put on pedestals. Oh, I was successful enough I guess, but never made it the way I wanted to--or thought I wanted to. It was always going to be better tomorrow somehow. It was in the future. Now in reading this again, it is some of the best advice I can think of. Fully accepting where we are and realizing that wherever we want to go we can get there from here is profound and peaceful. It is not giving up on goals or desires. Frankly, it has been my own personal experience that in lightening up, the desires show themselves more clearly and I can achieve them with far less stress than I used to put myself and my family through. Another way to say it is to make peace with where we are. Allow it to be. Allow ourselves to taste it right now, and feel the presence of that peace that comes from a certain contentment, however temporary. One of the best ways to say it is that we are enough. We have enough. We are enough. Having more is okay. Yet, right now it's all good. The Horizon Is Much Brighter From Here. Spread Some Joy Today--Love yourself, what you have, and where you are in your life travels. 2. Choose contentment right where you stand. The latter is quicker and lasts longer." Having studied all kinds of things about life and living from a myriad of authors, I have always believed and have also found that truth is very simple and very old. It is not complicated. True enough, there are lots of directions from which to view it, but it is the same regardless of the viewing direction. When someone says there are 10 things, that is too many. It isn't that hard. It is easy and it is supposed to be easy so anyone who chooses to can get it, understand it and make use of it. How do you find contentment? Choose it now. No long list of ways. No 300-page book on the subject. Just choose it. Where ever you find yourself, in whatever circumstance you are in, you still ultimately have the choices in your court. Just choose it. This applies to happiness. It applies to peace and peace of mind. Whatever it is you want, just choose it. Now. Spread Some Joy Today--It is always and always has been your choice. Want to spread joy? Choose it now. Choose to be joyful and the spreading of it will happen automatically. than anger at someone else?" This is an interesting quote. It jumped off the page at me when I saw it. How many times I have made peace with others and not myself. How many times have I beat myself up for making stupid decisions or used poor judgement? How many times have I felt bad about mistakes, wished I could have do-over, wished I would have thought it through. In fact, often when I might have been angry at someone else, I found myself even more angry at me for being so upset about them. Now, that makes no sense, and most anger doesn't make much sense either. Somehow we might think it is okay to be down on ourselves. Many have said that self-depreciation is a good thing. I have found otherwise. Everything is simply experience. If we can leave it that simple and admire it for what it is, we need no remorse or anger either one. I've made some silly decisions and I still carry baggage from some of that, but I don't fret about it as I used to. In fact, I think it is all just a big game. My father was killed when I was 13. His birthday is today, and he died now 50 years ago. That is amazing to consider for me. He would be 84 now, but the reason I bring that up at all is that life is short enough and some times it is shorter still, so worrying about anything is so nearly a waste of time and energy that it is hardly worth mentioning. I've become a joy seeker. Even more than this, I have become a joy finder and a joy creator. I find and experience joy every single day without exception. I find things to appreciate all around me. I have changed the way I make judgments. I rarely make any now. Peace of mind is a powerful thing in my life and my anger with myself regardless of what I've done, or failed to do, is almost nil. Hallelujah! It Is What It Is: Experience. Spread Some Joy Today--2, 4, 6, 8, what can you appreciate? Make a list! I find such interesting talks and sharing going on at Ted.com and once in a while one stands out enough that I share it in the Daily Inspirations. This is an inspiring video to say the least and has so much to consider in its short timeframe. I hope you enjoy it as much as I did. It's Always Interesting To See How Others Shine. Spread Some Joy Today--Be yourself. to buy back his past." I hear some people talk about past hurts and unfairnesses. Even though it is long over and gone, it is dragged back into the present moment to ponder, discuss, lament, laugh, remind us again. Often, people try to make sense of it and say they've forgiven so and so and that they've let go and such, but the reality of continuing to drag it back into the present speaks more to the truth that there really is not forgiveness, nor letting go, nor understanding even. It's just that the more time that has passed, the less powerful it is. Yet, that is an illusion, because it is very powerful. I have had all these experiences myself. I decided that I didn't ever want them again. It's a work in progress, but I'm ahead of the curve. What changed for me is expressed nicely this quote from Alan Cohen: "Nobody shows up in your world except by your invitation." I have accepted the idea that I am the creator of my own reality, that good and bad are purely my own judgments or opinions, and that by acting as if I created everything and every situation on purpose, I can accept responsibility for my life, my actions, and my experiences. At first it was challenging to seriously consider this idea, but the more I thought about it, the more it made sense. And the tools I used most often to create the change in me have been gratitude and appreciation. Consider this quote by Henri Nouwen: "Gratitude as a discipline involves a conscious choice. I can choose to be grateful even when my emotions and feelings are still steeped in hurt and resentment. It is amazing how many occasions present themselves in which I can choose gratitude instead of a complaint." I love how he says that "gratitude is a discipline." Choosing gratitude when things and circumstances encourage us to use different emotions is a tool to change the circumstances and things in time. The second tool was appreciation. I have gotten into such a habit of appreciation now that everywhere I go, I am mentally finding something in every person, event, and situation to appreciate. I talk to myself mentally all the time when I'm out and about. Now, the truth is that I have always talked to myself about others when out and about, but for most of my life, it was rarely appreciation. I was usually finding fault, seeing what I didn't like, thinking I wouldn't do that or dress that way or whatever. I began practicing appreciating and it has paid off in a dramatic change in me. And it feels so good too. So, by taking the tools of gratitude and appreciation to the past hurts and unfairnesses, puts them back on our own creation rather than being victimized by others. This is truly the only way to have control of our lives. No One Else Can Hurt Me. I Am The Only One Who Can Hurt Me. But, I Choose Not Hurt. Spread Some Joy Today--Take charge of your joy. Use the two tools of gratitude and appreciation. My partner gives many more presentations about our Internet business package of services than I do. That's his job and he does it well. But, sometimes I get to do it and stay in practice. So, a client and friend arranged a meetup with a potential customer whom I've never met, nor knew anything about. It was a very friend-oriented meeting. This meeting lasted almost three hours. That's unheard of. If it goes over an hour that is generally not good. However, often we are doing a lot of the talking probably. In this case, since I knew nothing, I wanted to know about him. I learned a lot about him as his business and him as a person, along with some ideas about him in the future. As it was, I ended up talking about 20 minutes out of almost 3 hours. The power of sincere listening is unmistakable and also on the most desired list. So few take the time to just listen. It is an amazing way to learn. I could have been doing something else, but probably nothing nearly so important. I loved this quote above about creating a sanctuary by listening. It is so true. When we give that space; that opportunity; that privilege of humanity, we are giving love in a special way. I know you know what I'm talking about because you have felt it when someone gives you that kind of sanctuary for your homeless parts. It may not happen often, or often enough, but you know the feeling, so it is a powerful reminder to give openly to those who are craving it. I'm Not Convinced I Had To Talk At All. Spread Some Joy Today--Give the gift of attention. Listen. Be a joy-giver. all the heads in the world." I've heard men in business say about another, "oh, he wears his heart on his sleeve." I take this to mean from their statement and demeanor that this guy is too sensitive and lets his heart overrule his head, and more. It's too bad that people think this way about people full of heart. In fact, I think the heart should lead the head and I also think it makes a far better organization. Money should not be the driving force in business. Though it is absolutely important, the heart is love and where there is love there is peace and joy. Those are great things to have in business. Think about running a business with this question in mind: "What would love do now?" And, keep asking, "what would love do now?" It makes so much more sense than "what would fear do now?" Don't you agree? People would say about me that I wear my heart on my sleeve. It's true. And, I think I am all the better for it. Spread Some Joy Today--Begin by listening to the other person. Maybe for a good while. It is amazing how it makes another feel.